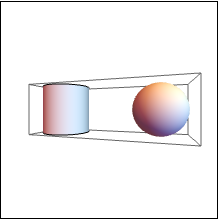 is an option for Graphics3D and related functions that gives the opening angle for a simulated camera used to view the three-dimensional scene. 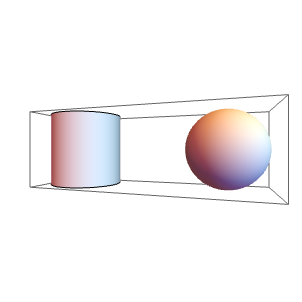 With the setting ViewAngle->All, the complete bounding box or circumscribing sphere will, if possible, just fill the final 2D viewing area. The default setting of Automatic is equivalent to All when the simulated camera is far from the object, but is constrained never to be greater than , even when the camera is close. ViewAngle->35Degree is a typical field of view used for human ergonomics and in cameras. Changing the setting for ViewAngle is effectively like zooming a camera. Explicit settings for ViewMatrix override settings for ViewAngle.